Candidates Minimum Age will be 21 Years & Maximum Age will be 28 Years as on 01.07.2017 (For PATWARI) & Candidates Minimum Age will be 21 Years & Maximum Age will be 35 Years as on 01.07.2017 (For LEKHPAL). General & OBC Candidates have to Pay Fee Rs. 300/- & SC/ ST Candidates have to pay Fee Rs. 150/-. Fee will be submitted in Form of Demand Draft & IPO. · Read the Uttarakhand Government Patwari, Lekhpal Recruitment Notification Pdf Clearly. 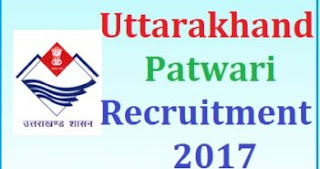 · Eligible Candidates can click on the link to the Application form for Uttarakhand Government Patwari, Lekhpal Posts. · Fill all the details in the Uttarakhand Government Lekhpal Online Application Form. · Submit the Application form and Pay the Application fee. · Submit the Application form before the Last Date. Take the Print out for further Use.